Fresh Comb Honey right from the hive. Bees did a fabulous job this year! 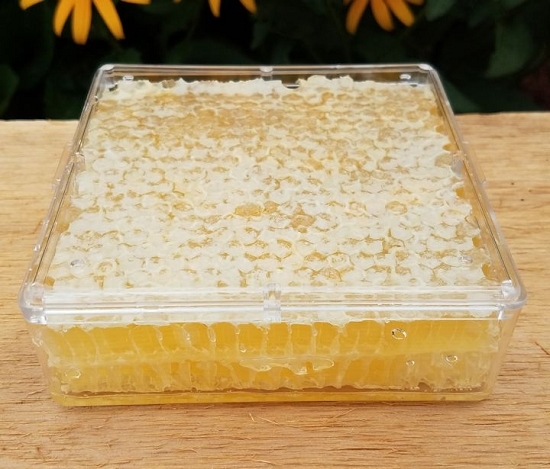 Comb honey looks and tastes fantastic! ~ 14-16 oz. per package. Comb measures approx. 4 in. x 4 in. x 1.5 in. Comb honey and how it is taken off the hives. 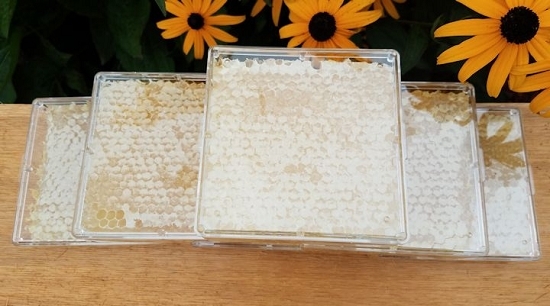 These pictures show how we harvest comb honey. We take the completed comb honey out of the "supers" (bee hive) and then we cut each frame of comb honey into 4 sections. We then take these sections and place them into containers to sell. Comb honey still on frames. Comb honey is cut off wooden frames and placed into containers. These containers are slightly larger than 4" x 4". 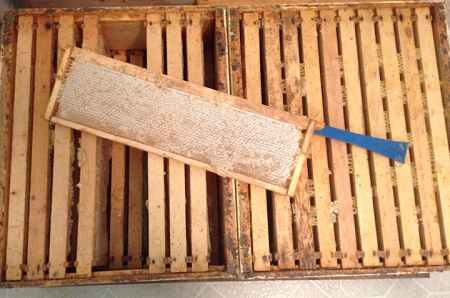 Comb honey, also called honeycomb is the most natural honey you can buy - we cut the comb honey right off the wooden frames. Comb honey is taken directly from the hive just as the bees made it. People like knowing that nothing has been added or changed in the way the bees made it. We cut it by hand - no machines or heated knifes are used to remove it. All the nutrients, flavor and other wonderful properties that honey provides in one container of comb honey. 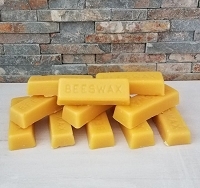 Kids also like to keep chewing on the beeswax just like chewing gum. Comb honey is what our grandparents grew up on and it's getting tougher to find beekeepers who produce comb honey. You can actually freeze comb honey to keep it from crystallizing. Simply place the container of comb honey within a Ziploc freezer bag, then place it in your freezer. When you want to eat it remove from the freezer, thaw it and it will be fresh as the day we shipped it to you. 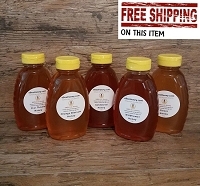 We have customers who will order lots of comb honey for the upcoming holidays and give comb honey out as gifts. Love this comb honey, can not find any here. I eat a little bit each day and the flavor of the honey is Great in the comb. I was out shopping with my daughter and saw some honey for sale. She told me how she wants honeycomb. I have ordered from you guys before, but only yet Honey Stix. So when I saw you have the actual honeycomb I was excited!! Soooo glad I bought it before it sold out. It arrived safely, love the packaging. She is going to love opening it on Christmas. I try to get her creative and different gifts. Things that are thoughtful. This honeycomb is not something I could have purchased from around here. Thanks so much!! Beautiful comb honey. So delicious too! Thank you for such great products! I remember eating comb honey as a kid but have not been able to find it in stores and at markets it is super expensive and you only get a small piece of comb. 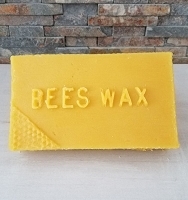 I am glad ebeehoney is still going the extra mile to produce this product. 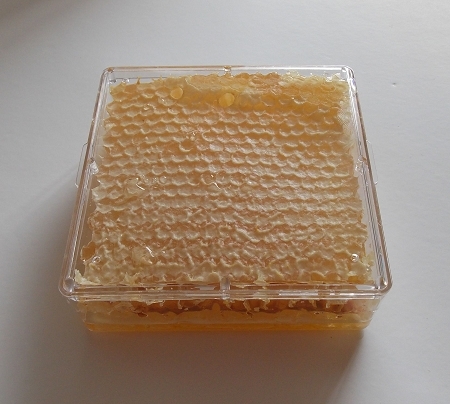 This is not honey with a bit of comb in it, it is comb saturated with honey as seen in the picture. 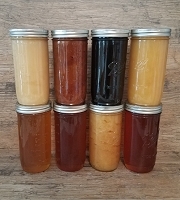 Another great batch of Comb Honey. My family and I really enjoy comb Honey. We have been ordering these honeycomb for years. Some for us and some to give. We get it packaged so nicely. You can see this is a labor of love on Glenn and Becky's part. Thank you so much for your service. The honey comb is very delicious. I highly recommend it to everyone. Packaged well and shipped quickly. I have not had any honey comb in 30 years. Your product is truly the best ever. I savor each and every bite I have. I have told many of my friends about your company and your honey products. Keep up the good work. Delicious ! Perfectly packaged and promptly shipped. We were pleasantly pleased with the comb honey. It was delivered in great condition and the flavor is wonder. We are enjoying it on homemade biscuits, I also drizzle it on my Greek yogurt/fresh berries. that I enjoy for breakfast every morning. This is some of the best honey I have ever tasted. 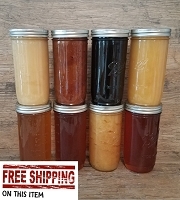 I received some comb honey from Ohio as a gift last year and loved it, so I was looking for a source for more when I found this site. Since it is getting harder and harder to find honey with the comb, I thought I would try it. I love the color, texture, and best of all the taste. I highly recommend it! This is better than the bricks I get from other suppliers, a tiny bit higher, but well worth it. People are willing to pay more for really high quality stuff and this is! Best honey I've ever tasted. Ordered numerous times. Great in hot cereal, tea, as a medicinal. This is the best honey I have ever purchased. It is really hard to find the honey comb anymore so I tried some from here. I really love the color, texture, and of course, the taste. I won't ever look to get honey anyplace but here in the future. I highly recommend it to all honey lovers! This was the best comb honey that I've tasted in a very long time. It was packed extremely well, it was fresh, and so yummy! I love this honey! I heard also that comb honey helps allergies. So I am all for help with that! Absolutely amazing Honey! 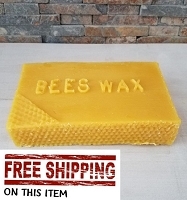 Best honeycomb I've had, great prices and fast shipping. Highly recommended! I love this honeycomb! The flavor is so delicious and it is great spread on warm, freshly baked bagels. I eat this when I'm feeling sluggish, unwell or before a workout for a natural energy boost! We've been buying comb honey from EBEEHONEY since they started selling it. No better anywhere. We love it. By far the best honey I've ever had the pleasure of tasting. The wife and I both loved it. Ordered another comb and also some creamed Orange blossom that should be here any day. Can't wait. Thanks Glenn. Love your honeycomb! Came packaged very well with no leaking of the honey. Very pleased and will buy again. This honey comb is so sweet! Just like the good ol' days. Thank you. 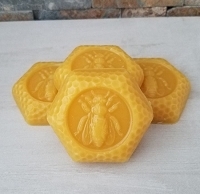 A very light and delicious clover honey flavor and you can chew on the wax for a long time. I received my honey in a undamaged shipping box. My comb honey was carefully packed in packing peanuts. The two packages of comb honey and two honey dippers were packed in a zip lock bag unfortunately my honey leaked out of the containers and into the plastic bag. I haven't tasted the honey yet because of the condition of the package. I'm sure the product is wonderful. I plan to try it soon. I have been looking for comb honey in Ohio for a while now. We fell in love with star thistle comb honey this past spring up in Northern MI. This clover comb honey is delicious!! Highly reccomended, but save some for us! It is amazing on a water cracker with some really creamy brie! Great tasting honey from the comb! 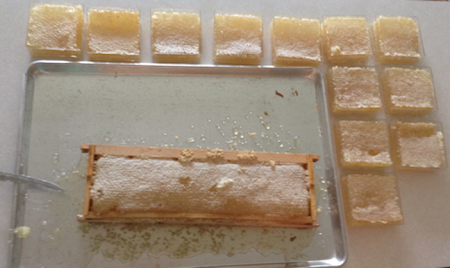 Also wonderful to chew on the comb after the delicious honey is eaten. Amazing taste I am so glad I bought this. I love bees!!!!!!! It's unlawful for these honey combs to be soooo delicious! (Thank Goodness it's not! Hehe) My 2 years old daughter and 5 years old son are now addicted to everything regarding to bees! They ask for honey comb on bread every morning for breakfast! I even gave some to my in-laws and they keep raving about them even though they get honey combs from their Georgia friends all the time. Will definitely order more very soon! The honey comb I got was great and I'm so glad I was able to get some before it was gone. Honey comb has helped my legs and I eat it regularly. It's a great product. I fell in love with honeycomb while on a trip to Turkey and was always looking for something in the US that tasted like it.. I found it w/this one! We spread it on toast and it is simply some of the best honeycomb I've ever had!! Delicious! This makes a great gift and is yummy and a great teaching tool about where real honey comes from! 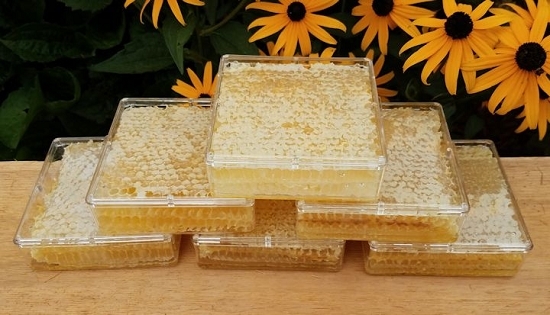 I have never had comb honey before and did not know what to expect, It was great and I shared it with everyone I could and I was happy to share the information about the honey bees themselves and how special they are......next time I will buy more than 2. The honeycomb - clover was truly the best honey I have ever taste. Thank you for a great experience!!! This honeycomb is the best I have had. it is fresh and tastes great. A special treat in my childhood was comb honey. I have been so pleased to find Ebee on line since I cannot find comb honey in stores. This year I ordered four combs and they arrived well packed in perfect condition. 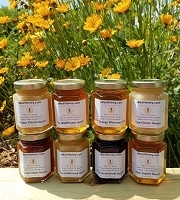 Now when my son and grandson come for breakfast we can all feast with comb honey on toast. Thanks for good care of those bees. Such a pleasure to have this available delivered to the door. I ordered this comb honey recently and it brought back memories of my childhood. My first grade teacher brought in some comb honey for everyone I had never tasted anything better before and have seldom since. The quality and purity are outstanding. Thank you so much! Oh my golly this is awesome! Chewing on a piece of this had helped with my allergies. Thank you so much. Love my order. Comb Honey -a treat yah can't beat! You've got to like it, to buy it! 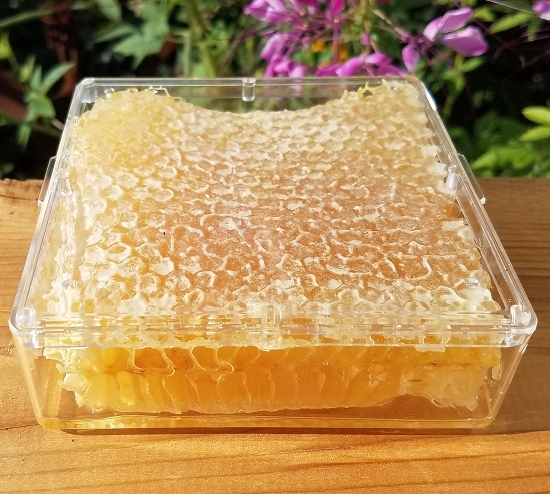 The cut comb honey came, in boxes which made it possible to see and grab the spoons, and to show the work of honeybees exactly as it happens to children. Did honey manage to escape through cracks? Yes! Did the eBee folks deal with that? Yes, indeed! A good deal, all around, for learning, tasting, seeing and sharing. Careful shiping and packing, and very good quality honey. Thanks, eBees! I bought three pieces of honeycomb. Upon opening the box I noticed they were still very much intact and appeared fresh. The honey is amazing, I absolutely love it. I have to stop myself from eating it. I guard it with my life and let no one eat a bite. You can't beat the prices either. I will be ordering again. This is absolutely wonderful! I will order it again and again! As usual the honey is delicious. Unfortunately, one of the packages leaked and caused a little mess. I am so hooked on this honey. Best quality and value. And it makes a great gift!